Trade fairs and exhibitions are usually exceptionally busy places, which makes it difficult for business to stand out from the crowd. Unless your stand design is eye-catching in some way, prospective customers won’t remember you, and if they don’t remember you, you are unlikely to hear from them after the event. Custom exhibition stands are vital in environments like this. 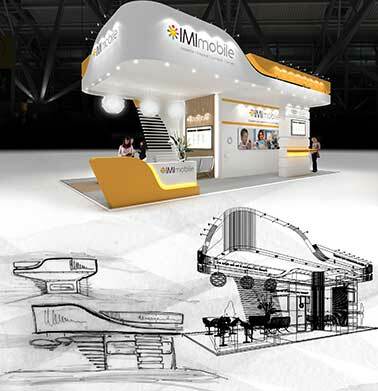 We specialise in creating memorable, eye-catching, custom exhibition stands for trade fairs and pop-up events. It is important that a trade stand is inviting and innovative. Anything less won’t be able to compete in the frenetic environment of a large exhibition hall packed with people. Our designers recognise this! We know you need a bespoke exhibition stand that fits your brand and projects the right image. So our experienced designers will work closely with you to produce a stand design that fully optimises the space you have to work with. Achieving the right stand design means people will recognise your brand, in turn the foot traffic into your trade stand will increase. The right exhibition stand design will maximise your sales opportunities and make it easy to interact with new and existing customers. That way your team can start doing what they do best from the get-go: making sales and increasing brand awareness. Get in touch with our stand design team to find out more about our custom exhibition stands and what they can do for you.